We like to keep tabs on any new developments in network expansion and modernization here at TmoNews. After all, if we just waited for official word on new upgrades, we’d only get them once per quarter. And those announcements never really paint the true picture of what customers are experiencing. We’ve been sent a handful of sightings over the past couple of weeks that make for encouraging reading. One area T-Mobile’s needed work for some time now is 4G coverage in rural areas. Two readers, from very different locations got in touch from two small towns to let us know that they’ve had access to 4G (HSPA+ and LTE) for the first time. 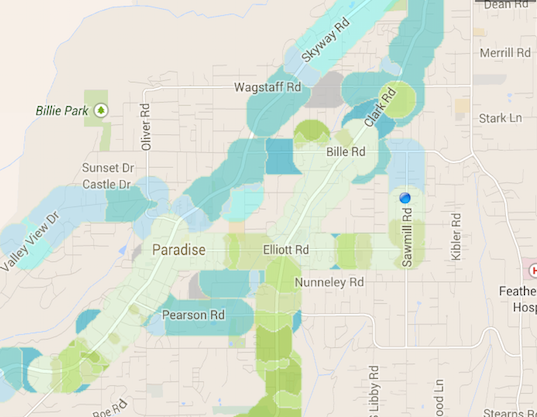 This area, Seaside in Oregon has switched to 4G LTE in the past month. The Google Maps screenshot shows a ‘current location’ indicator, and the ‘4G LTE’ symbol in the status bar. And, although speed test results don’t put it up there with the likes of Dallas or Houston, TX, it’s still a huge improvement when you’re used to trundling along on EDGE. In the case of Paradise, it would appear the HSPA+ is only being tested at the moment. Signs are encouraging nonetheless. Our reader noticed the ‘4G’ logo pop up on his phone in areas which were previously just EDGE. He did manage some speed tests, but results were very low, indicating that it is in the early phases of being switched on. We weren’t able to verify if LTE is also being tested since the device wasn’t LTE capable. If you happen to be in the area with a LTE phone, let us know if you receive LTE service. T-Mobile’s spreading the Wideband LTE love further afield, and the latest we’ve been informed of is the city of Rockford, 86-ish miles north west of Chicago, IL. Speeds, again, aren’t the fastest we’ve seen, but those should hopefully improve over time (presuming the upgrade isn’t done yet). As you can see from the screenshot on the right, it’s showing up as a 15+15 network in Service Mode on our reader’s device. As always, thanks for sending in your sightings. Don’t forget, if you spot any changes in network performance you can get in touch with me by sending an email to cam@tmonews.com. Include screenshots indicating performance, and tracking on Sensorly’s app if possible. ← Which legacy T-Mo device or range would you bring back? San Antonio’s gotten some back haul upgrades recently. Been in the mid 50s a few times where things were previously capped at 40. Still 10×10, too. Philadelphia and its surrounding areas still needs 2×15 Wideband and also a much denser network, as I have seen EDGE in Willow Grove and some parts of Philadelphia. Philadelphia is getting strange behavior today. My note 3 is going crazy. Switching from LTE to 4G during calls or dropping the call period. That was in willow grove area heading to Doylestown. Now same thing is happening in Chalfont, Volte dropping to 4G. Sounds like upgrades to the network are happening. Same thing in Denver, CO last month or so. Really where are you seeing this? I live in Highlands Ranch. At work in Downtown. On wifi at home so don’t notice it as much. They are upgrading the network. I was there months ago and the LTE was blazing fast. 2 weeks ago it was slow relatively. Then i was told that they are adding the Metro PCS network to the T-Mobile network. Hopefully soon the reception with return stronger and faster. They need to decommission MetroPCS’ network there before they can turn on wide channel LTE. Rockford isn’t a small town, it’s larger than Peoria & Bloomington/Normal and we’ve had LTE for awhile now. Rockford has ~150,000+ people. Looking at T-Mobile’s coverage maps, it seems like this has been covered for awhile now. It may have been covered by LTE for a while, but it hasn’t always had wideband LTE. I’m assuming with the colleges in those area’s, there was more of a demand for LTE by students who come from native LTE areas. Yeah, I wasn’t referring to Rockford when I used “small town” in the title, hence why I used the name specifically. Small towns in this case were Paradise and Seaside. 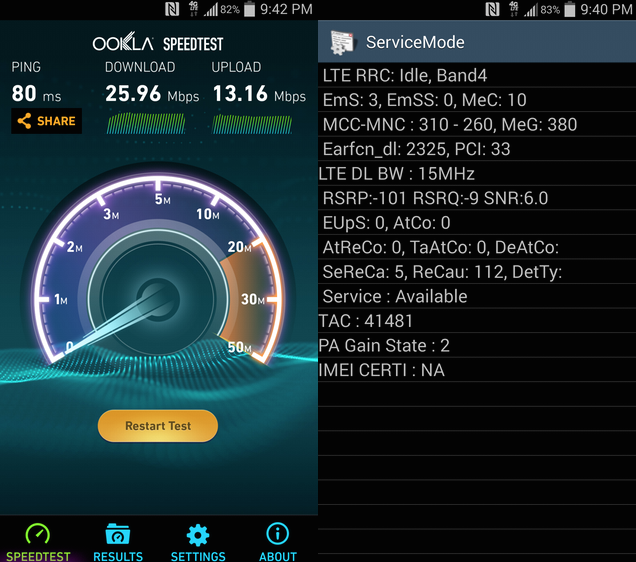 While I am glad I see Rockford upgraded, T-Mobile needs to deploy HSPA+/LTE between Rockford and neighboring cities. One step at a time, Tom. I’m sure they have a list of cities by priority. Let’s give them credit for what they’ve done thus far and not only focus on the shortcomings. Could someone explain to me what wideband LTE is? And what’s 15×15 also? Simple explanation is it’s faster, and more people can use it at the same time before it starts to slow down. Wideband is when they deploy at least a 15×15 MHz channel for LTE. In the context of AWS-Band 4 frequency, this whole spectrum is from 1710-1755Mhz. This spectrum is divided into 6 chuck and are label A – F (there is actually lower frequency which I left out). AWS Band A starts at 1712, there is actually a band-gap between each Band, not sure the actual bandwidth for each gap – could be 2-5Mhz. So, when the cell site is provision at 15×15, it simply uses Band A, B, and C. The corresponding frequency for each is 1712Mhz, 1737Mhz and 1762Mhz. Think of it as adding more lanes to your nearest highway. Less congestion and faster speeds. So from 10x10MHz to 15x15MHz or 20x20MHz. Still no Wideband in Bridgeport or New Haven Ct. I was just in Milford, at the Taco Bell and Key Hyundai dealership, got 49mbps, but I checked, it isn’t Wideband LTE. Madison Ohio is finally seeing LTE, been on EDGE FOREVER. Nice to see T-mobile stepping it up! I believe its because Cincinnati has a low amount of AWS(1700) spectrum. Not sure about PCS(1900) in Cinci. I’m sure T-Mo is working on that. Source? Haven’t read this yet. How is it set up? 10×10 AWS + 10×10 PCS? Will we ever get HSPA 42 in Clermont County and farther east? I’m waiting for Batavia and Owensville to get anything better than EDGE before I come back from the new Cricket (AT&T has ruined it BTW). Oh wow, that’s a super low amount of AWS spectrum for a city (non-rural). So I guess to get HSPA+42 its 10AWS+10PCS (forget the tech term to use two different bands). Wonder why Tmo hasn’t used 10MHz(5×5) PCS for LTE for the time being, and use the remaining 10MHz of PCS for GSM. Unless having 3 generations of Cell tech (GSM, HSPA+, LTE) cramped together isn’t too efficient. Still LTE-less in Des Moines, IA as well. Will be interesting to see which city gets it first. Beginning to believe neither ever will or they would have done it by now. Doesn’t give me much faith in their Edge to 4G pledges either. Getting GSM unlocked phones as I upgrade in case I decide to give up waiting and I have to switch to the Death Star in the next year or so. Just FYI, Seaside was not EDGE before the LTE. They’ve been 3g/4g HSPA for years. The LTE is new within the last two months, however. I just hope we see better coverage on more of the Oregon coast soon. I can’t believe that Tillamook isn’t really covered at all yet by T-Mo (just shared AT&T towers from what I understand). I was there in June. I had bars, but couldn’t even get a data connection. Agreed. Unfortunately anything south of Canon Beach is solid EDGE. 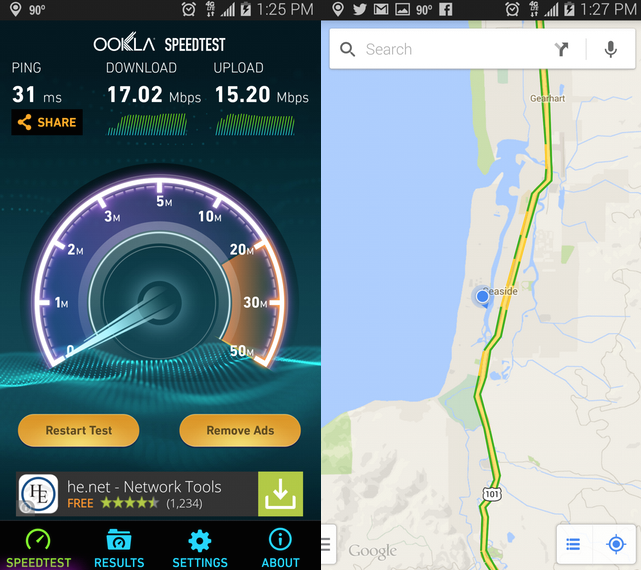 Was in Tillamook a few weeks back and there was coverage, but only only 2G. Seems like they disabled the AT&T roaming that used to be there. Heck, we just need data to work at all. I would be happy with 2G speeds. All over the place (like Kelso/Longview or Mt. Hood) we have good strong Edge signal but zero data connectivity. I’m not saying that they need to cover the planet – but where we have strong signal: data should work. Isn’t TMobile supposed to be “data strong”? Sure there is LTE in Rockford but drive towards Chicago and you’ll be enjoying a 2G throw back. T-Mobile’s coverage maps are intentionally misleading by blending all of their colors together. I really wish they’d just accurately depict their coverage and differentiate between 4G and LTE, etc. How fast does T-Mobile update the coverage maps for new areas covered? Does anyone know how to access Service Mode or something similar on a stock Nexus 5? I’ve looked online and the *#*# codes have mostly been for Samsung devices.